There is nothing obvious about the mathematics we know. It is basically neurology we learn, that is, that we learn to construct (with a lot of difficulty). Neurology is all about connecting facts, things, ideas, emotions together. We cannot possibly imagine another universe where mathematics is not as given to us, because our neurology is an integral part of the universe we belong to. Let’s consider the physics and mathematics which evolved around the gravitational law. How did the law arise? It was a cultural, thus neurological, process. More striking, it was a historical process. It took many centuries. On the way, century after century a colossal amount of mathematics was invented, from graph theory, to forces (vectors), trajectories, equations, “Cartesian” geometry, long before Galileo, Descartes, and their successors, were born. Buridan, around 1330 CE, to justify the diurnal rotation of Earth, said we stayed on the ground, because of gravity. Buridan also wrote that “gravity continually accelerates a heavy body to the end” [In his “Questions on Aristotle”]. Buridan asserted a number of propositions, including some which are equivalent to Newton’s first two laws. 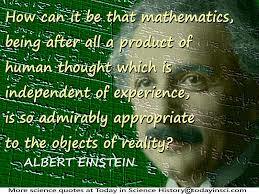 Because, Albert, Your Brain Was Just A Concentrate Of Experiences & Connections Thereof, Real, Or Imagined. “Human Thought Independent of Experience” Does Not Exist. At some point someone suggested that gravity kept the heliocentric system together. Newton claimed it was himself, with his thought experiment of the apple. However it is certainly not so: Kepler believed gravity varied according to 1/d. The French astronomer Bullialdius ( Ismaël Boulliau) then explained why Kepler was wrong, and gravity should vary as, the inverse of the square of the distance, not just the inverse of the distance. So gravity went by 1/dd (Bullialdius was elected to the Royal Society of London before Newton’s birth; Hooke picked up the idea then Newton; then those two had a nasty fight, and Newton recognized Bullialdius was first; Bullialdius now has a crater on the Moon named after him, a reduced version of the Copernicus crater). In spite of considerable mental confusion, Leonardo finally demonstrated correct laws of motion on an inclined plane. Those Da Vinci laws, more important than his paintings, are now attributed to Galileo (who rolled them out a century later). This effort is generally mostly attributed to Galileo and Newton (who neither “invented” nor “discovered” any of it!). Newton demonstrated that the laws discovered by Kepler implied that gravity varied as 1/dd (Newton’s reasoning, using still a new level of mathematics, Fermat’s calculus, geometrically interpreted, was different from Bulladius). Major discoveries in mathematics and physics take centuries to be accepted, because they are, basically, neurological processes. Processes which are culturally transmitted, but, still, fundamentally neurological. Atiyah, one of the greatest living mathematicians, hinted this recently about Spinors. Spinors, discovered, or invented, a century ago by Elie Cartan, are not yet fully understood, said Atiyah (Dirac used them for physics 20 years after Cartan discerned them). Atiyah gave an example I have long used: Imaginary Numbers. It took more than three centuries for imaginary numbers (which were used for the Third Degree equation resolution) to be accepted. Neurologically accepted. So there is nothing obvious about mathematical and physics: they are basically neurology we learn through a cultural (or experimental) process. What is learning? Making a neurology that makes correspond to the input we know, the output we observe. It is a construction project. Now where does neurology sit, so to speak? In the physical world. Hence mathematics is neurology, and neurology is physics. Physics in its original sense, nature, something not yet discovered. We cannot possibly imagine another universe where mathematics is not as given to us, because the neurology it is forms an integral part of the universe we belong to. This entry was posted on April 21, 2015 at 10:54 pm and is filed under Foundations Physics, Mathematics, Neurogenesis, Neurology. You can follow any responses to this entry through the RSS 2.0 feed. You can leave a response, or trackback from your own site. Dear Patrice, the idea that logical amd mathematical structures are expression of neurological connections is an amazing idea. Never thought of it this way. Is this your idea? I still don’t know what to make out of it. Your connection between the physical world and the mathematics seems to me too simplified, or at least I don’t see the connection. Anyway i need to digeste this idea. Yes, yours truly’s idea, entirely. Glad that you find it amazing. Too simplified? I have a second round, a bit deeper, at the ready.